The main goal of Oceans Day has always been to raise global awareness about the challenges facing our ocean ecosystems. Since 2002, The Ocean Project and the World Ocean Network have helped to organize events and activities with schools, conservation organizations, aquariums, zoos and other interested groups. The 2012 World Oceans Day theme was “Youth: the Next Wave of Change.” Over 400 events in 55 countries were documented on this day, including film festivals, art contests, beach clean ups, educational programs and seafood events. “Together we have the power to protect the ocean!” is the theme for 2013-2014. If your classroom or school is interested in planning an activity to celebrate this day, you may want to take a look at the official website: worldoceansday.org. You will find lists of events and activities from previous years as well as educational resource packages and other useful bits of information. Using literature in the classroom is an engaging way to focus student interest on a particular theme or topic. 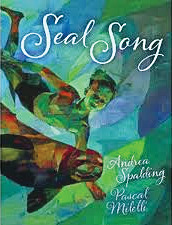 This beautifully illustrated new picture book from Andrea Spalding and Pascal Milelli would be a great springboard to a classroom or school-wide celebration of World Oceans Day. Finn’s father is a fisherman. When each day’s work is done, the boy slips away from the cannery sheds to a secret cove where the seals gather. He loves to swim with them. One day he rescues a young seal that has become entangled in some netting. The seal is weak from her struggle with the net, so he pushes her up onto the beach. He catches some fish and feeds her until she regains the strength to return to the water. Finn wishes that this friend could live on the land. That night the seals sang. The following afternoon a strange young girl appears on the docks. The fisher folk believe that she is a shape shifter—a selkie, a magical seal. Finn ignores the whispers and enjoys playing with his new friend, Sheila. The salmon ran well, and the fishermen caught plenty, though Finn and his father were always the luckiest. The whisperers said it was unnatural. During this time Finn and Sheila mend nets, gather firewood and play together but the young girl never approaches the ocean. At dusk she disappears into the shadows. One day as Finn and Sheila are heading into the forest to gather mushrooms, Finn looks back and sees that the fish are jumping. Despite Sheila’s plea to stay on the shore, he jumps into his skiff and rows out into the bay. With this catch, he thought proudly, I have landed more fish than Father. “FINN!” screamed Sheila as she lost sight of him. Finn’s boat floundered in the heaving swells. The wind howled, freezing his hands. The rain became blinding sleet. “Which way?” he cried. On the beach Sheila sang, “Eeeeiiiiiii, eeeeiiiiii.” A magic song. A seal song. Sheila runs to the wharf and alerts the fishermen of Finn’s plight. Then she runs to the water’s edge. As she enters the waves her shape changes— she is a young seal swimming. The storm raged all night, leaving wreckage along the dawn-lit coastline. In the secret cove, Finn lay asleep on the shore. Protecting him, like a velvet blanket, was the seal. A fall frost sparkled across her back. “EEEEiiiii.” The seal nudged farewell with her nose and slipped into the sea. During the winter Finn helped his father to build a new boat. On each fishing trip after that they tossed a salmon to the seal who swam beside them. Stories of selkie seals are found in Scottish, Irish and Icelandic folklore. They are also the subject of storytelling on the east and west coasts of Canada. It is thought that the Shetland and Orkney Islands are the birthplace of the seal legends. The word “selkie” is derived from the Old English word seolh (seal). Inferring helps the reader to better understand the story. Readers need to look for clues in the pictures and the text as well as relying on their own background knowledge to fill in what is not written on the page. Some authors deliberately write very little but leave the reader clues to think about. Explain to the class what inferring is (something that good readers do to understand what the author is saying even if it is not written in the text). Explain that inferring requires the reader to think about the clues that the author has left behind in the text and in the pictures. Explain that readers can also use their own background knowledge to help fill in the missing information. Repeat the above activity using students to model an emotion. Discuss, as a class, what clues the models gave you that helped you to make inferences. Show picture #1 to the class (enlarged on an overhead or an Elmo would work well). • describe some of the details that you can see in the picture and infer from them. Show picture #2 to the class. Model inferring with the students: Describe only one of the details that you see in this picture and make an inference. Have some of the students help you with the modeling by volunteering to tell you what they can see in the picture and what they can infer from that detail. Continue until all the details are covered in the discussion. Show Picture #3 to the class. Model inferring with the students: Describe one of the details you see in the picture. Have each student talk to one partner. Have them discuss the other details in the picture and make inferences from those details. Have the students report out to the larger group. Have them justify their thinking (I think… because…). Repeat the modeling and inferring lesson from Picture #3 with the last picture. Have each student talk to a partner and generate a list of facts that they now have about the story. Have them report their facts to the larger group. Record the list on the chalkboard. Have each student talk to a partner and generate a list of questions that they have about the story. Have each student report one question to the their group. Record the questions on the chalkboard. Read the story to the class. Pause to comment and look at the pictures where needed.